Violating the United Nations Charter by launching an illegal "War of Aggression"
including white phosphorous, depleted uranium, and a new type of napalm. phone calls and emails of Americans without a warrant. 2000, 2002, 2004, and 2006.
legislation negating the Bill of Rights and the Writ of Habeas Corpus. 2001, and in increasing air pollution causing global warming. Soon, Santa will be delivering sacks and sacks of mail to Nancy Pelosi initiating impeachment via the House of Representative's own rules. This legal document is as binding as if a State or if the House itself passed the impeachment resolution (H.R. 635). 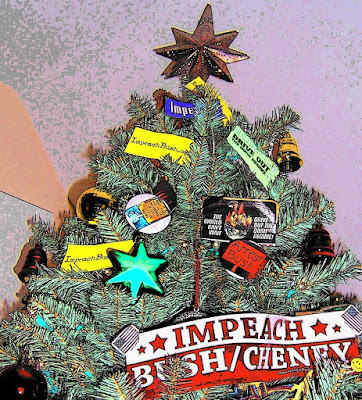 What better gift to give this holiday season than the restoration of our democracy? Truly the gift that keeps on giving. Over this past year, Bush has become an even greater threat to our Constitution. Lucky for us, the rules of the US House of Representatives allow for individual citizens like you and I to initiate the impeachment process directly! This process was successfully used to impeach in the past. Be a part of history and have a merry impeachment this season! Outgoing Congresswoman Rep. Cynthia McKinney (D-Ga) has orchestrated her swan song on Capitol Hill – the introduction of a bill that calls for the impeachment of President Bush.